ANDRÉN & KNAPP - FURNITURE, "Font - Plant City, FL"
We made the fiberglass shell used as a basin. 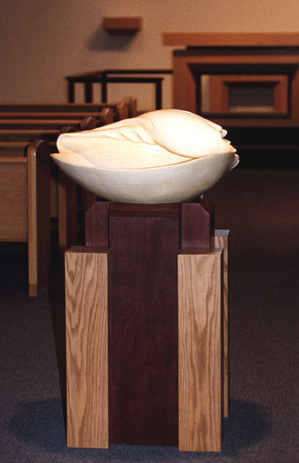 It is a replica of the smaller real shell the congregation had been using when they were a fledgling storefront church. The shell has a drain and there is a hidden door in the purple heart wood base which leads to a sliding shelf with a tank for the water. We also made the altar, pulpit and many of the other furnishings.